In 2010, the Rockbridge Family of Companies bought Thad Paschal’s 18-year-old Austin, Texas-based regional alarm company, Protect America. From then on, there was no stopping Protect America on its march to becoming a national powerhouse with more than 500,000 customers. 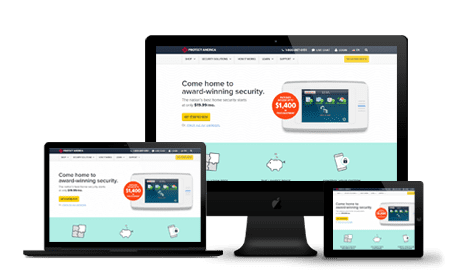 With Protect America, customers pay no upfront costs for a complete home security system, making it among the most affordable and easiest ways to get top-notch home security solutions. Protect America has been named a Consumers Digest Best Buy for five consecutive years running. In 2013, Top Consumer Reviews.com gave the company a five-star rating, and Protect America has been ranked #1 by at least three home-security review sites. All packages come with the same basic equipment: a Simon XT Control Panel, 3 door/window sensors, 1 motion detector, 4 window decals, and 1 security yard sign. The Copper package includes all of the above-mentioned features for $19.99/month and is landline only. The Silver package comes with the same equipment as the Copper but upgrades you to a touchscreen control panel and 9 door/window sensors for $37.99/month. With this plan, you have the option to purchase the control panel touchscreen version for $99. The Platinum plan is $42.99/month and comes with the same equipment as the other plans and 14 door/window sensors. All packages can be upgraded to include equipment for HD video service, smoke & fire monitoring, smart door lock controls, garage door controls, and smart lighting. The security fee for all equipment is $99. Protect America contracts run for three years, and after that automatically go month-to-month. There is a $99 upfront equipment cost. The company allows customers a full 15 days to check out its systems, requiring a $19.95 activation fee and the customer covering all shipping fees. Package prices are for 24/7/365 monitoring by landline. Monitoring by broadband or cellular is also available and adds to the price of each package. A free mobile app remotely monitors and controls the features of all cellular packages. As long as you have a permanent residence and good credit, you can easily qualify for a Protect America home security system. The centerpiece of all Protect America packages is the Simon XT control panel. It includes a built-in keypad, interior siren, and battery backup. All Protect America packages can be customized to include a wide array of components including HD wireless monitors, monitored smoke detector, and home automation. Protect America offers 24/7 professionally monitored security by triple redundant monitoring stations nationwide and trusted emergency response in seconds. Protect America uses partner Criticom to provide monitoring services 24/7/365, and three types of monitoring are available with any system: landline, broadband, or cellular. The company also has equipment for fire, flood, environmental, and medical monitoring. The SMART Connect mobile app gives you the freedom to arm or disarm your alarm system, view live video, adjust lighting, control door locks, and more. Protect’s technology is designed to send you text and email alerts to advise you of suspicious activities when your sensors, smoke detectors, and other equipment is triggered. Alerts via the mobile app include crash and smash alerts if any components are tampered with. Severe weather and other natural occurrences are delivered via the app. And full history reports are available. Response time to duress events is as little as 10 seconds after the first alarm is received. Aside from the basic equipment included in all its packages, Protect America features a full array of additional components, allowing you to make the most out your home protection system by keeping all systems connected. They include such options as a smart home lock, a garage door controller, light dimmers, integrations with smart home devices, and more. Set up and use of your Protect America system is fairly straightforward, but if you feel overwhelmed or have any questions, the customer care representatives are available to help you out. All equipment is pre-programmed before being shipped to your door, so all you need to do is plug-and-play to get your system up and running. You can also easily arm or disarm, view cameras, and access alarm history via the app or online. Customer support is available 24/7 by toll-free phone, online chat, or email. Since all of Protect America’s packages are DIY installed, the company offers a complete array of video tutorials showing just how easy installation is. But just in case, technical support is a toll-free phone call away, any time, any day. Account information is available online as is a convenient online bill pay feature. If you need to move, it’s no problem. Protect America provides a free Easy Moving Kit and technical support to help you move and reinstall your system at your new address. There are support services online that are available, and emergency service support is available 24/7. Phone support is available from 8am to 9pm CT Monday through Friday, and from 9am to 7pm on weekends. Live customer support is available via chat. There are lots of videos on their YouTube channel. There is a FAQ section on their website. Yes, there is an extensive blog that is updated regularly. In terms of upfront costs, there’s no comparison: Protect America is one of the cheapest on the market. In terms of functionality, Protect America’s systems stack up well against the more expensive competition. Equipment is delivered to your front door and is guaranteed against defects for life. With simple DIY installation, you save money and time dealing with costly installers coming to your home. Systems can be installed in less than an hour, and live guidance from Protect America’s customer support representatives means you can have a customized wireless monitoring and protection system set up in your home without having to break the bank. Though you must have the Silver subscription package and up to use the interactive features and accessories are pricey, the service and equipment are known to be reliable.